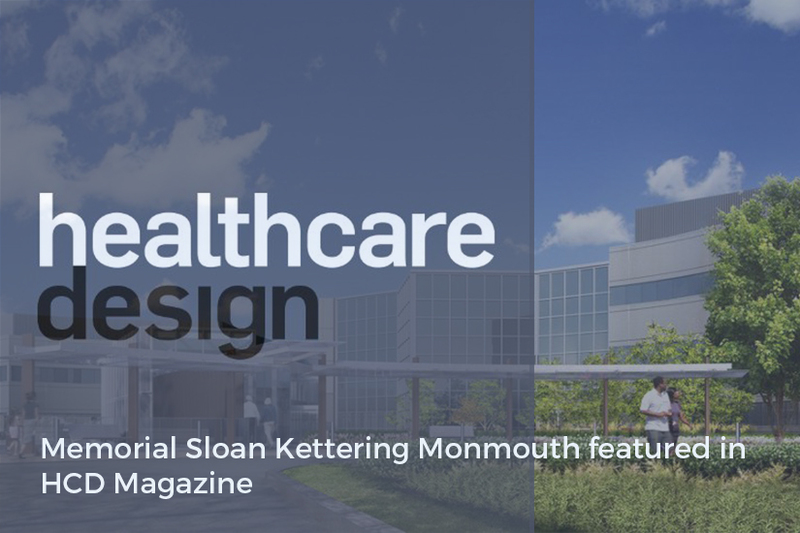 Memorial Sloan Kettering (MSK) Monmouth is a renovated, 120,000-square-foot facility in Middletown, N.J., designed by Perkins+Will and completed in November 2016. 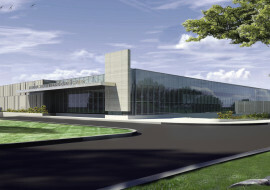 It’s MSK’s second freestanding outpatient treatment site in the Garden State, offering central and southern New Jersey residents a new option for care closer to home. 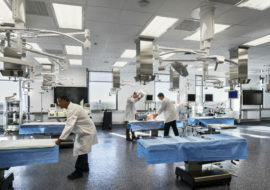 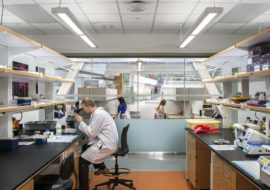 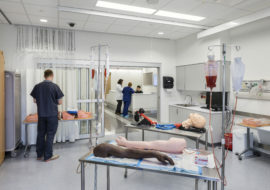 Previously a vacant 1980s suburban office building, the new facility transforms the space into a modern cancer care center. 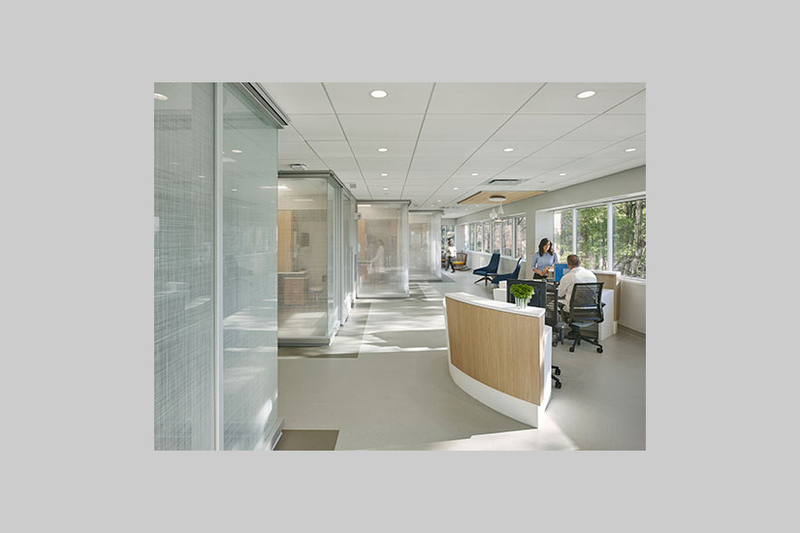 Perkins+Will employed biophilic and other evidence-based design principles to improve healing, such as ample views to nature and abundant natural light. 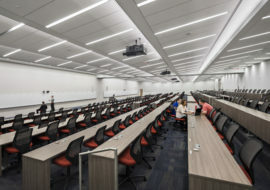 The design concept is based on a “walk through the woods,” and the use of materials, furnishings, and details, enhances a sense of wooded surrounds throughout. 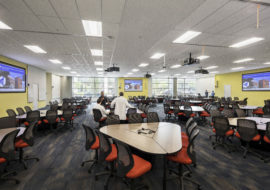 One of the primary challenges the design team faced was how to transform the existing office building, which offered little natural light and poor accessibility, into a light-filled, warm, and welcoming space that promotes healing. 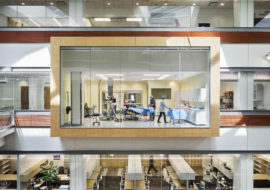 To accomplish this, to enhance patient arrival and access, and to also meet current seismic codes, the team cut into the existing office building and created a large, daylit courtyard that provides daylight to patient spaces. 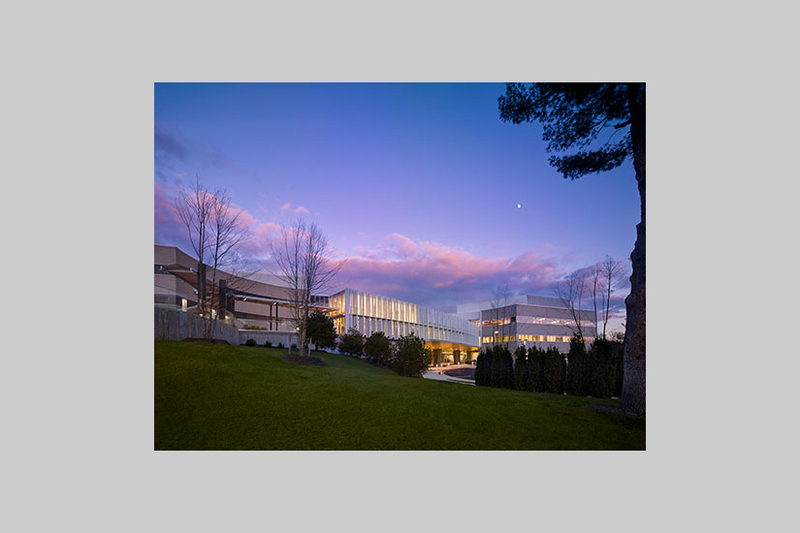 Next, a series of glass-enclosed pedestrian bridges that cross the courtyard were created; one such bridge is the center’s main entrance, which follows the east-to-west arc of the sun to maximize daylight exposure. 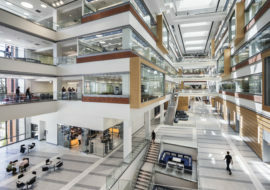 Inside, office spaces along the window-lined perimeter of the building were removed to create a seamless glass wall and pedestrian corridor overlooking a wooded ravine. 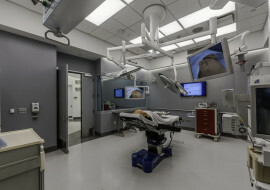 The team also carried out a study to evaluate which areas cancer patients might feel most vulnerable, uncomfortable, or have the least amount of choice and control, especially during procedures. 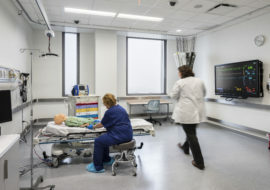 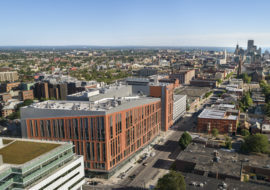 Combined with MSK’s own input, the results of the study led to the team’s emphasis on warmer, softer, more “humane” treatment spaces, with sensitive focus on changing rooms, exam rooms, consultation rooms, and infusion therapy suites. 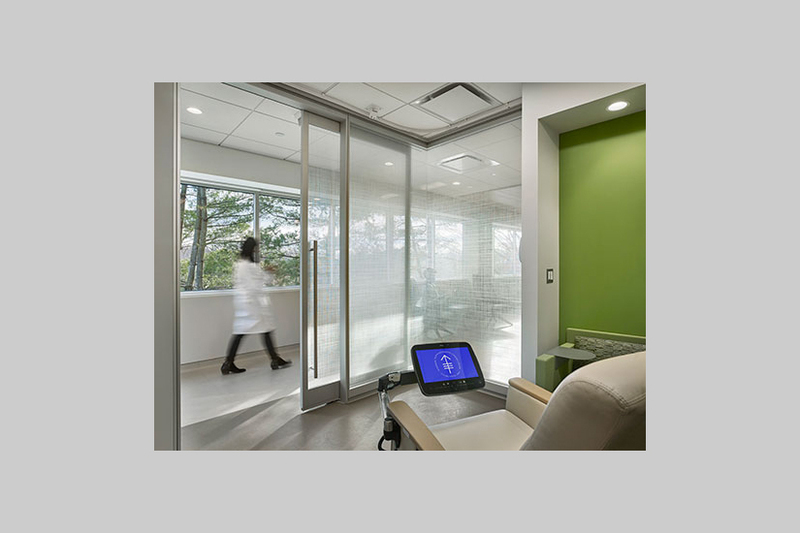 By incorporating elements of nature and hospitality to the building, the Perkins+Will team was able to create a space that ensures the comfort of patients and their families at every phase of cancer treatment—a very important part of the healing process. 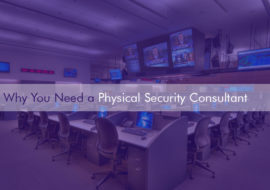 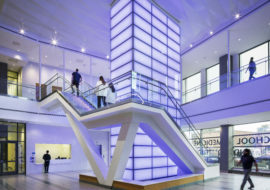 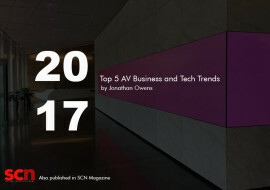 SM&W was proud to provide A/V, Telecom, Security consulting services for this project with MSKCC & Perkins + Will.